Color: White with Black dots. Tiles are made of solid plastic, and packed in black plastic case. Each tile has raised bumps to indicate its value, and a tactile line down the center. Tiles each measure 2 inches by 1 inch, and have a rough surface on the back to keep them from sliding around. Measures about 8 in by 4-1/2 in by 1 in. Package Weight: about 14.4 ounces. Everyone loves a family game of Dominoes, so we're pleased to introduce a set that has raised dots. Now everyone, blind or sighted, can join in the fun! 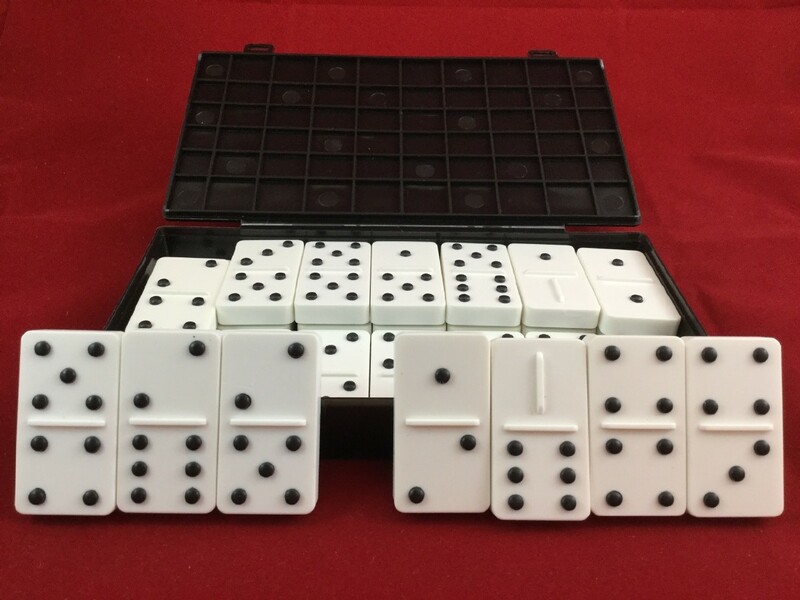 This set comes with 28 plastic domino tiles, and a hard-plastic case to keep everything contained. On the dominoes themselves, you'll find large, raised dots to indicate the number on each side, and a tactile line down the center. Each domino even has a rough-textured back, to help keep the tiles from sliding around on the table. Tiles measure two inches long and an inch wide, and are made of solid plastic for a playing piece that's absolutely indistructible.